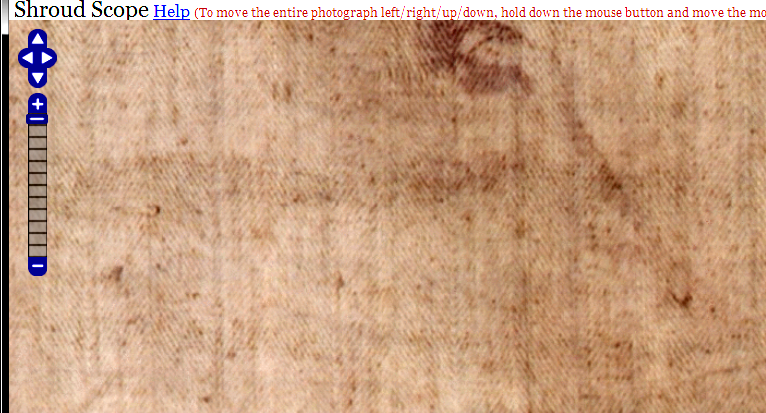 Is the Shroud of Turin really just 18 years short of its 2000th birthday? SEE THIS BLOG FOR A DAILY ACERBIC OVERVIEW OF CURRENT WRANGLING (currently 2015, Week 34) | Is the Shroud of Turin really some kind of supernatural photographic 'selfie'? 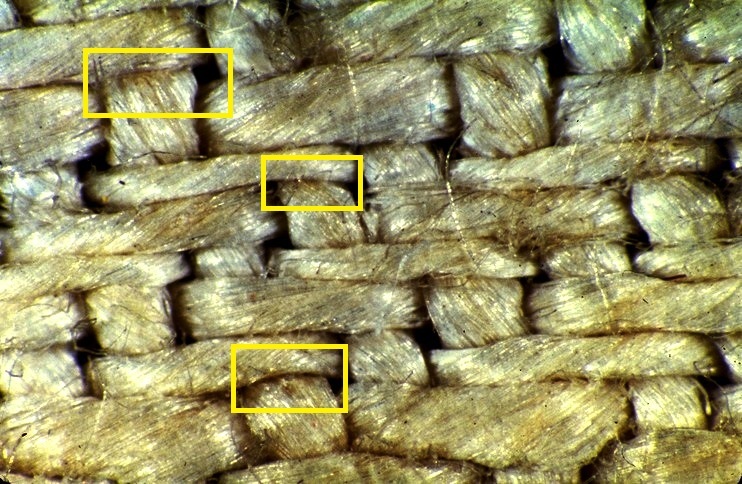 Topic 9: Why are some of the thread crossover junctions coloured in the Shroud body image zones, in addition to crown threads? 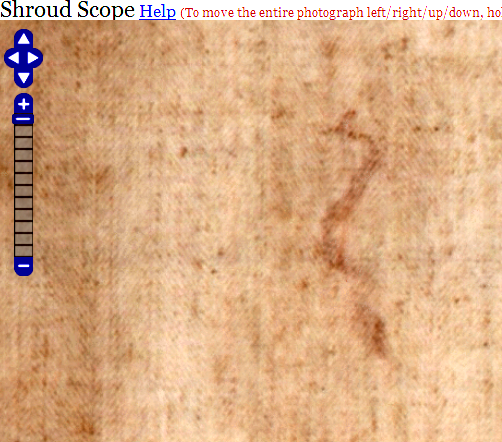 32x Photomicrograph of the Shroud of Turin showing Image at the small of the back. Note coloration in some junction areas as well as the better-known crown threads. An experiment with lycopene-enriched sunflower oil offers a possible answer. This experiment was prompted by a curious feature in the Mark Evans microphotographs. It’s not just the thread crowns that are coloured – easily explainable in a contact-only imprinting model – but some of the recessed areas of the weave where one thread dips down under another, herafter called the junction areas. 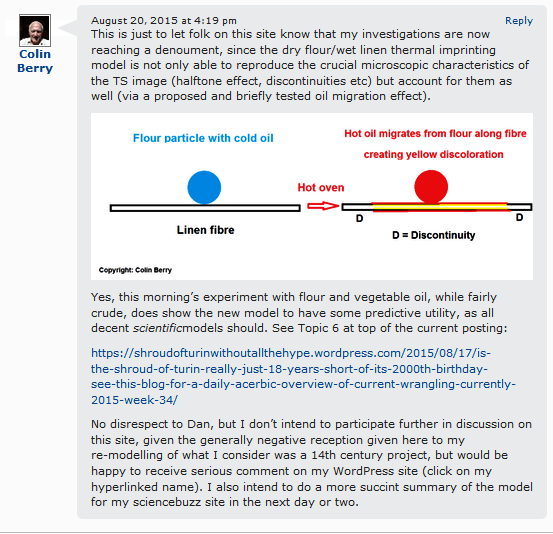 Might this anomaly be explained in this blogger’s ‘oil-seepage’ model? There are two sources of oil to be considered: oil that is intrinsic to the flour imprinting medium, i.e. endogenous oil, approx 1.5% by weight, but there’s another source that needs to be considered – exogenous oil. That’s the fancy name for additional oil that may have been used to get better imprinting (already demonstrated by showing that one gets faster and more intense development of colour in the oven when there’s vegetable oil as well as flour). There’s another practical reason for using oil. Instead of dusting skin with dry flour only, one first smears oil over the skin, then dusts with flour, and then inprints onto the wet linen. The film of oil is a way of ensuring a more even coating of flour on the skin, quite apart from its beneficial effect on image devolopment in the hot oven. As mentioned earlier, one would like to colour up the vegetable oil in some fashion, but there would be a delay in ordering, say, Sudan Black (a fat-soluble blue-black dyestuff), and there’s the small matter of it being suspected to be a carcinogen. 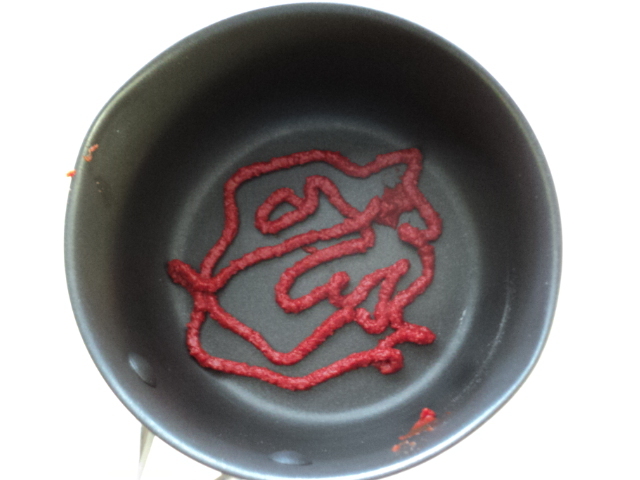 As a rough-and-ready alternative, I have used the oil-soluble lycopene of tomato paste, responsible for the res colour of tomatoes, as marker. Lycopene is a hydrocarbon carotenoid, C4H56. All one has to do to get red vegetable oil is to mic tomato paste and water, add the vegetable oil, then bring to the boil. One then takes off the orange oil that floats on the surface. Tomato paste, before boiling with water and sunflower oil. A number of combinations of flour +/- lycopene oil and lycopene oil+/- flour were tested in the standard procedure of imprinting onto wet linen and then placing in a hot oven. Intermediate stage: best colour development in the lycopene oil/flour micture. Sample removed for microscopy before returning to oven. Highly intense coloration in the oil/flour area while the flour-only control has scarcely started to colour. Also interesting is the colour in the oil-only imprint. Is that entirely due to the lycopene? What is the distribution of colour under the microscope? Are there resemblances with the “Shroud” body image (or parts thereof)? Microscopy results to follow in the next hour or so. Back again (17:00) having been preoccupied with shroudstory’s coverage of this posting and the usual crop of highly judgemental and/or agenda-driven comments. (All that matters where this investigator is concerned is establishing the facts re the ‘enigmatic’ body image, it looking increasingly explicable – albeit ingenious in its directness and simplicity – with each passing hour). Here are 4 photomicrographs showing what my lycopene-coloured vegetable oil did to linen fibres in the thread cross-over junctions. Thanks goodness for contrast-enhancement, since the effect might otherwise have been easily overlooked. “As is” left; added contrast (right). Time now to go and have another peep at the shroudstory site. Will be back later this evening to ask whether the above experiment achieved its objectives, namely to cast light on the reasons for the TS body image being in the cross-over junctions as well as thread crowns, and whether oil – endogenous or exogenous – might have played a role in the coloration at that unexpected location. Interpretation: since oil alone is capable of producing colour at the junction areas, lower in the weave than the crowns, it is maybe appropriate to flag up a further development of the flour imprinting hypothesis. So far, the crown colration is pictured as having two components. The first is the prominent orange colour one sees on removeal from the oven, which is provisonally regarded as a Maillard reaction product (confirmatory evidence required). However, that is too intense to be a model for the TS image. For that, one has to attenuate the image, e.g. 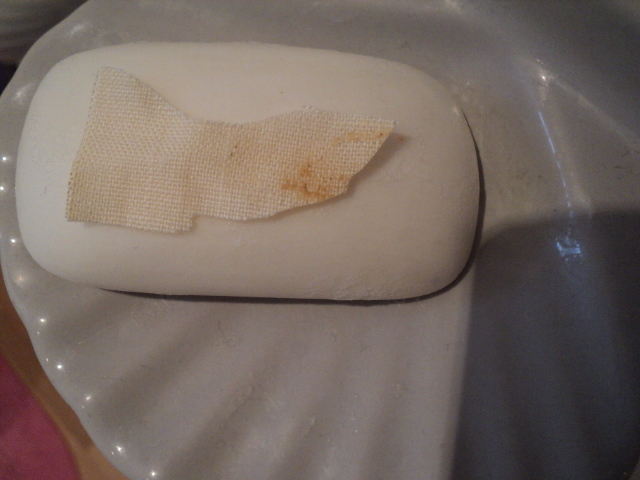 by washing vigoroulsy in soap and water to dislodge the encrusted orange material. One is then left with the fait, fuzzy TS-like image. But that is not necessarily on the surface of the fibres. It might be inside, as previously suggested, and while its precise chemical nature is conjectural, the halftone effect and discontinuites have led this investigator to think it may be due to migration of something from the heated flour when it becomes very hot, possibly the endogenous lipids (oils and melted fats, phospholipids etc). Given they are minot components of white flour, typically 1.5% by weight, the coloration is confined to the crowns. So what about the junction coloration one sees on the TS? Since that can be modelled with exogenous vegetable oil, it is tempting to see that as a prior evidence that exogenous oil was used in addition to flour to produce the body image. It’s not difficult to imagine the subject being given a light smear with oil first in order to assist with more even adhesion of flour to skin before the imprinting onto wet linen. The oil has the added advanatge of accelerating the image colpour formation in the linen. Why the jubnction location? Probably a response to gravity. As the linen heats up and the water evaporates, the fibres become drier, and the oil can then begin to sink to the lowest point in the weave. It then enters the fibres and wicks up the channels inside, possibly the central lumen, thought that’s of very small bore. There’s the new alternative to consider, namely a lignin-enriched S1 layer in the outer part of the secondary cell wall, immediately below the PCW. might that be the true location of the TS image, whether the thermal development of colour was reliant on trace amounts of endogenous oil, or larger amounts of exogenous oil? Left: “as-is”. Right: some added contrast. Note the coloured image fibres, which this investigator says have brown interiors with uncoloured outer coats. I shall post this image to shroudstory as a riposte, and say that the next step is to tease those threads apart in order to view what clearly and unequivocally will be separate fibres, where there can then be no confusion between fibres and spaces between fibres. Topic 8: switching to higher magnification microscopy – tending to confirm one’s suspicions that the image colour is UNDER the primary cell wall (PCW), not a coloration of the PCW per se. 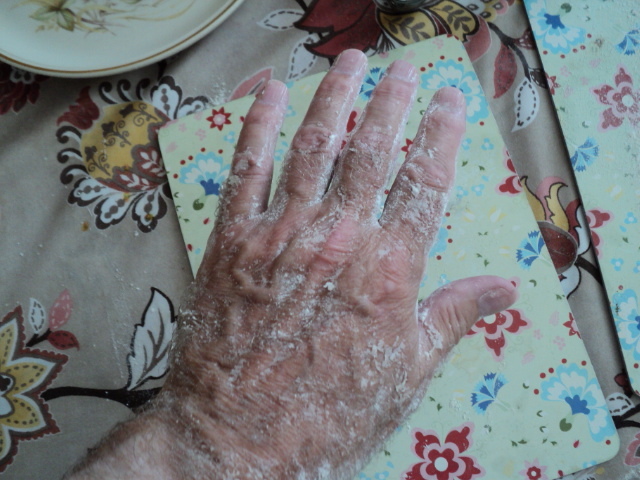 A short while ago, this blogger/investigator was exulting over the fact that the imprints of his fingers made with white flour onto skin first smeared with vegetable oil confirmed a suspicion that oil had a part to play in image formation. The images appeared faster in the hot oven. What’s more, the image fibres were more easily visible under the microscope – being of variable and often bolder intensity (no wishy-washy halftone effect!). That alone made the revised model more credible. Nothing beats a prediction confirmed! A decision was made to concentrate on that oil-supplemented system to explore further with the microscope under higher power – the extra magnification and bolder/darker images making it easier to see where precisely the colour was located in individual fibres. 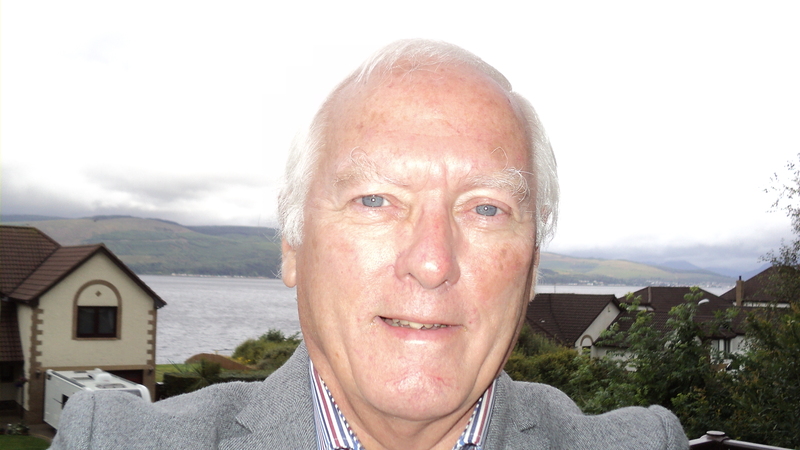 (Model systems have their uses – even if ‘pushing the envelope’ somewhat!). Well, here’s another finding that has this blogger thanking his good fortune, or heading off down a blind alley (only time will tell, but it should be clear ny now that wherever possible – and much to the chagrin of some – I tend to use a model-based approach when doing science, believing it to generate more useful data in a shorter time, even if the initial model has later to be abandoned in the light of the new data). “As image” faint yellow image fibres, flour/oil imprint onto wet linen, microwaved. Now look at the same image with maximum contrast, looking especially in the yellow rectangle. can you see what I can see? As above with maximum contrast. Note the coloured fibre highlighted. Note the coloration lies beneath a glossy reflective layer(PCW?) that is uncoloured! Late addition (Sunday 23 Aug ): have just been told by Thibault Heimburger that there are two fibres inside the rectangle, that the brown region is background. In fact this blogger studied a sizeable number of images, using gradations of contrast to arrive at his decision that structure one sees is a single fibre, albeit a ‘fattish’ one (image fibres vary enormously in diameter). The brown cannot be background because it frequently shows fine structure that is typical of linen fibres, notably those nodes, aka dislocations. Here’s another image from my archive that makes the point better perhaps than the one above. Note the ‘fine structure’ in those brown areas. They are not background. They are the pigmented inner zone of individual fibres that have glossy reflective outer coats, probably uncoloured PCW. 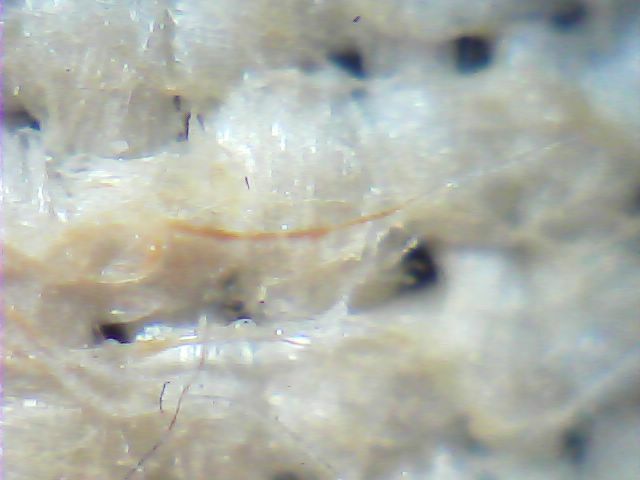 Image on the most superficial part of the linen fibre, i.e, the primary cell wall? Image in the central lumen of narrow bore? I think not. I don’t know about you, dear reader, but I’d say the image, i.e. yellow or brown coloration, was just under the PCW. Now why would that be? Cue image-receptive LIGNIN present in the S1 layer (first-formed secondary cell wall, after the PCW has been completed, to be found immediately underneath the PCW) ? Yes, it’s a long shot I know, but this location for the image layer would seem to tick a lot of boxes. Listing those boxes and ticking them might take some time – days rather than hours. Please bear with me. Am now getting the hang of using the microscope with the x10 objective. It’s a question of knowing where to look, and thius is where the oil-supplemented model comes into its own, acting as a ‘souped-up’ version of the flour only model. Here’s a new feature that hopefully illustrates my point. When one looks at the cross-over points (warp over weft or weft over warp) in the oil-supplemented model one sees heavily pigmented fibres emerging a short way from the junction, and then ceasing abruptly, i.e. showing the famous ‘discontinuity effect”. Increasing the contrast appears to support the previous suspicion, namely that the pigment is INSIDE the fibre, not just a coloration on the surface. But is that effect visible in the FLOUR-ONLY model? Yes, it is, as the following pictures show, but without the lead from the oil-supplemented model it would probably have been overlooked, or passed off as a trick of the light. 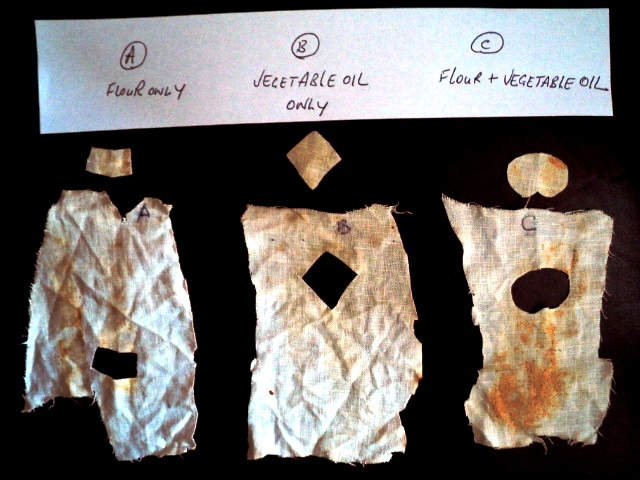 Flour + oil-supplemented (left) versus flour only (right). “As is” photomicrograph, x10 objective lens. Oops. Inavertently deleted. Will restore shortly. 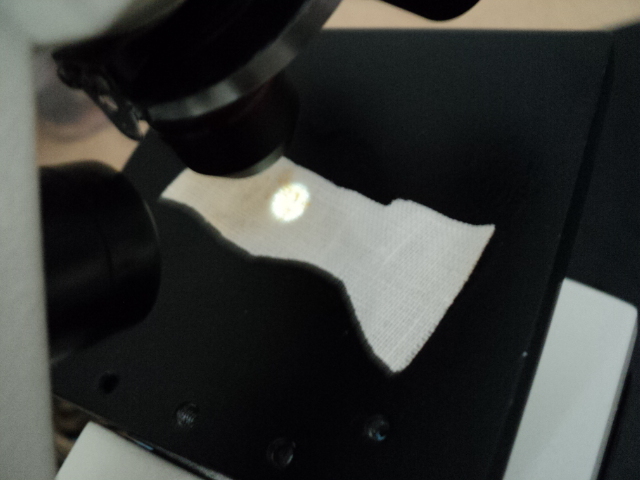 TOPIC 7: Moving to higher magnification (and poorer resolution). 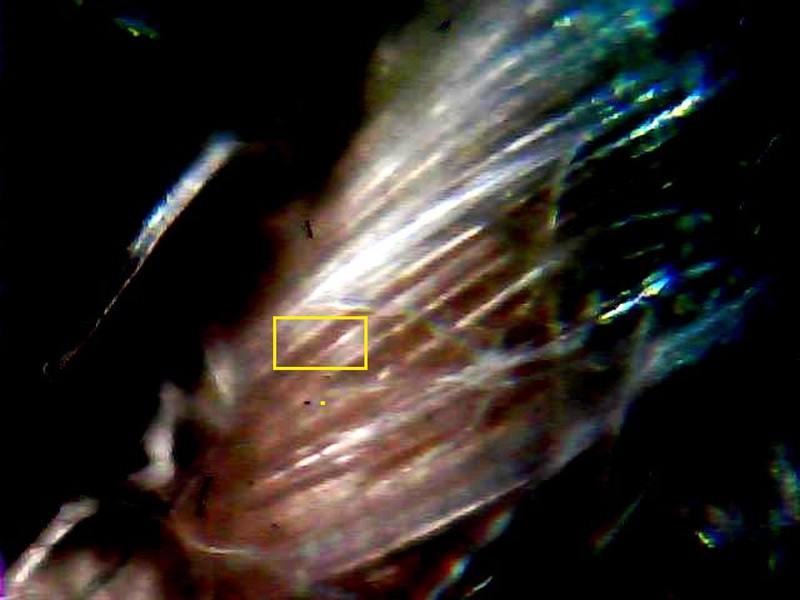 All this investigator’s photomicrographs of image fibres from model “Shroud” studies have been obtained using the lowest power objective lens (x4) on his bargain basement micoscope, and captured on screen via a handy USB attachment that replaces the objective lens. 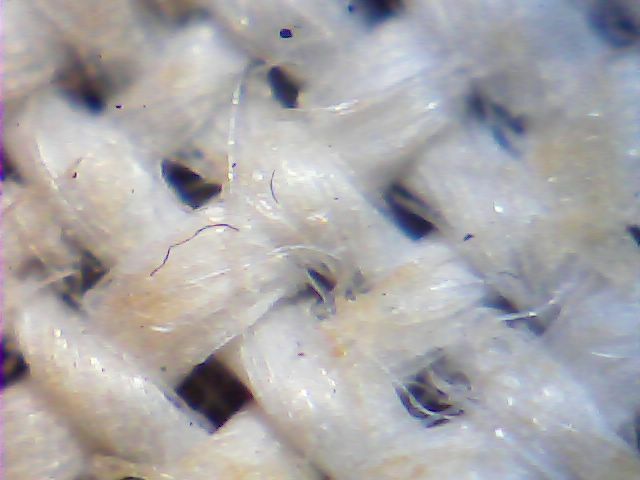 I’ve been reluctant to display images at higher magnification (using the x10 objective lens) on account of the poor resolution – which is less a criticism of the microscope, but more a statement of the formidable problem of viewing whole linen fibres with their highly light reflecting/refracting properties that make it difficult to make out internal structure, apart that is from those peculiar and distinctive nodes that give linen fibres their distinctive bamboo-cane like appearance. However, I’ll depart from previous practice and show a couple of pictures through the x10 objective of the imprints obtained from dry flour/wet linen in last’s night’s brief exploration of the microwave oven (which gives essentially the same results as the conventional oven) to show where the ‘seeping oil’ hypothesis is heading. (Reminder to one or two self-styled experts on all matters scientific and/or medical: hypotheses are for generating ideas for new experiments, and not to be regarded as dangerous heresies). More to follow. (This blogger reports results and interpretation – right or wrong – in real time). As above, different field from same sample of heated linen. 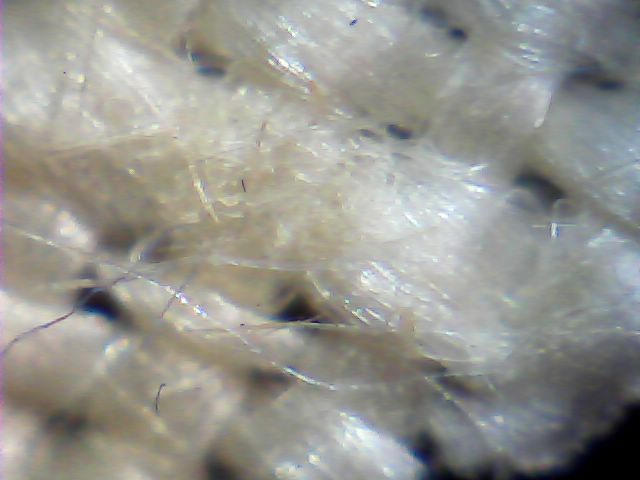 Where is the coloration on these fibres? On the outside? Or maybe underneath the primary cell wall? Is it premature to suppose that the image is on the primary cell wall? Is there anything else that might have acquired colour, maybe not quite so superficial, in the course of the imprinting/heating stage. Here’s the title page of a paper that might, just might, hold the answer to linen coloration by (a) the chemistry taking place in the current model system (b) yellowing of linen on ageing, exposure to light etc (c) possibly even Di Lazzaro’s uv laser-pulses. The focus is on lignin, the stuff that reinforces cellulose to make woody stems in shrubs and trees, but is present too in flax peripheral bast cells that are associated with the nutrient-transporting phloem cells ( NOT the more central woody water-transporting xylem tissue). Lignin is a highly resinous, water-repellent i substance.Chemically it is a polycyclic aromatic polymer. caveat. 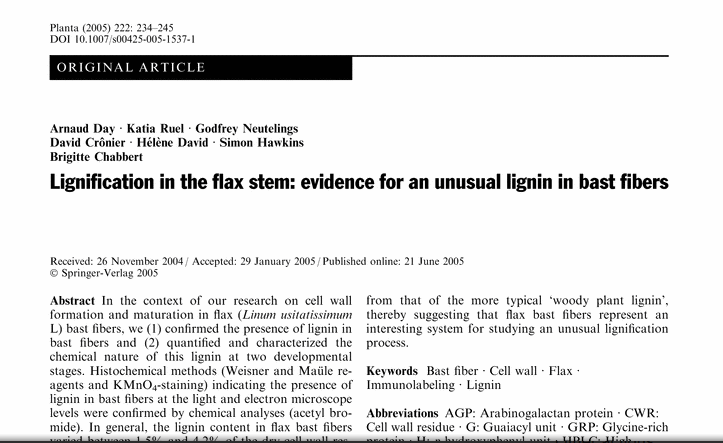 Caveat: the paper, which I tried to buy at great expense from the publishers but gave up on the intrusive registration system, is about the location of lignin in flax, not linen post-retting, and some of the lignin is in the matrix material that binds fibres together. Retting digests the pectins and other fermentable carbohydrates, separating individual fibres. But there’s still lignin present WITHIN the fibres, according to the paper’s abstract. What’s more, it in the S1 layer, the first formed secondary cell wall that is immediately underneath the PCW. Suppose it was this lignin, not the PCW, that was the target for yellowing in my model system (maybe the TS too?). Note the way that Rogers’ guesstimate of 200nm for the image layer thickness, which Di Lazzaro not unreasonably identifies with the PCW (rejecting as I do Rogers’ impurity “starch” coating) has been widened now to a range, extending in some communications up to 600nm! Might Rogers’ image layer that was left behind in the hydrocarbon adhesive on his Mylar sticky tapes have been more than just PCW? Might it have been PCW plus a lignified zone of the outermost (S1) secondary cell wall. Is that what we are seeing in those photomicrographs above – coloration that may be skin deep, but not in the most superficial PCW, but a little deeper. What on earth could have caused those weird characteristics? Migrating hot oil hypothesis to account for discontinuities in TS fibre coloration and possibly the so-called ‘half-tone’ effect too. Well, an idea occurred to this blogger a few minutes ago, and what’s more it’s testable after a fashion, so much so that it will be performed tomorrow and the result reported on the end of this Topic, whichever way it goes. The idea? Plain white flour from wheat has a small amount of lipid (approx 1.5%) . The latter is the collective terms for fats (solid at ordinary temperatures) and oils (liquid). If my memory serves me well, the lipid of flour is entirely oil, or nearly so. 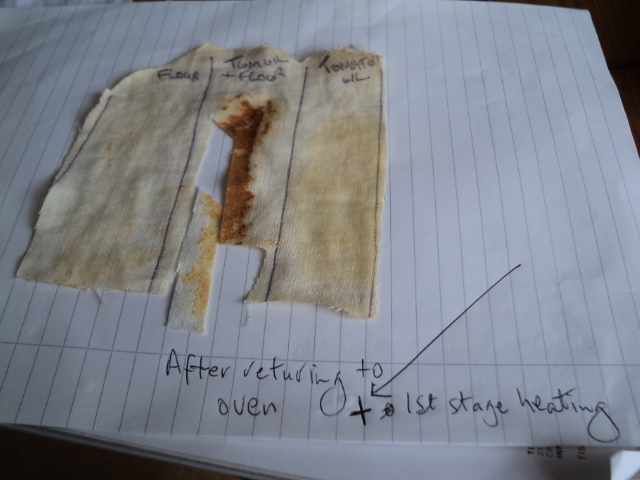 How’s that oil likely to behave when a flour imprint on linen is placed in a hot oven? My guess is that as it heats up, its viscosity will decrease. It will become runnier, and start to spread. But it has nowhere to go except the surface (sub-surface? interior?) of each fibre, first spreading the short distance around the circumference and then starting to migrate/track along the length of the fibre until a point is reached when it’s spread as far as it can go. Are you thinking what I’m thinking? As that film of oil gets hotter it will start to “fry” the carbohydates and proteins causing a faint and even coloration, due to the limiting amount of oil in any one place. As for the mechanism of coloration, well that’s anyone’s guess. It might be a Maillard reaction between protein and reducing sugars (there’s about 1.5% of those in white flour). It might be a caramelization of sugars, needing no protein, or it might be some kind of reaction between oil and flour. Irrespective, the mechanism is not the issue right now. What matters is testing the hypothesis. But how? There are ways of de-fatting foods, notably by organic solvent extraction, but I’m not equipped to do that at home. However, there’s another approach, which is to introduce a little extra oil into the system, and see if one gets more coloration of fibres relative to untreated controls. 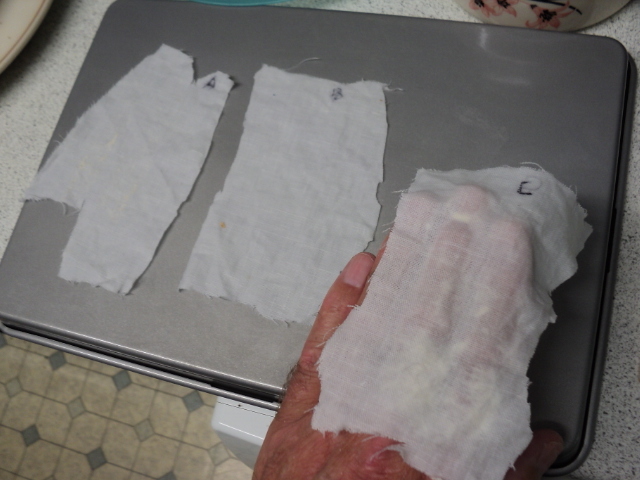 Experimental plan: I will smear a thin film of oil onto half of my hand, then coat the entire hand with flour, and then imprint onto linen, and then pop into the oven. Will the oil-coated half then proceed to brown faster than the control, and if so, will its appearance under the microscope give support to the proposed mechanism? We shall see. Watch this space (tomorrow, Thursday Aug 20). It’s now Thursday am, and a small scale pilot to test my prediction based on the ‘hot oil’ hypothesis has just this minute been completed. I’ll show a few photos first to show what was done and then the macro-level result. (Anyone with half an hour or less to spare can do this at home to see if they get the same result!). 1. Sunflower oil was chosen for the first test (it was that or olive oil). 3. Taking a peep inside the oven. Yes. the combination of FLOUR and OIL is browning faster, exactly as predicted. In fact, it was removed from the oven ahead of the controls, since I did not want it excessively browned, given that microscopy needs to be done on an optimally-browned sample. 4. Here are the three test specimens side by side. 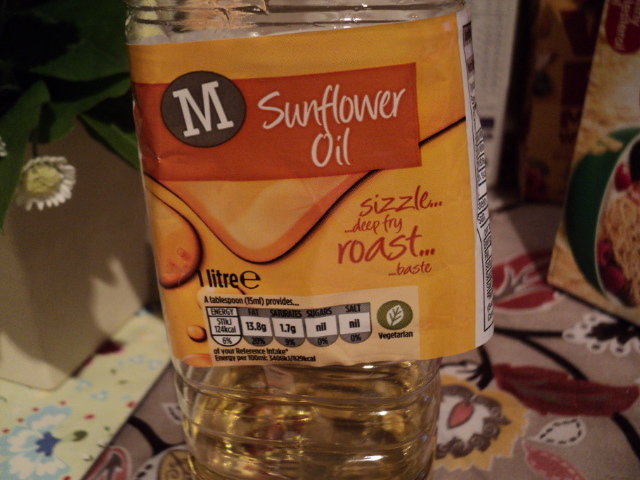 Interestingly, even the OIL only control (centre) shows a pale-yellow discoloration, more than would be expected from the intrinsic yellow colour of sunflower oil. It will be interesting to see how it looks under the microscope, alongside the paler fibres from C. Might the half tone effect be attributable to migrating oil, as per hypothesis? It’s all starting to look very promising. Back to the microscope: will show a selection here later in the day. Time now 08:15 in the UK. I’m reporting results as I get them in real time. 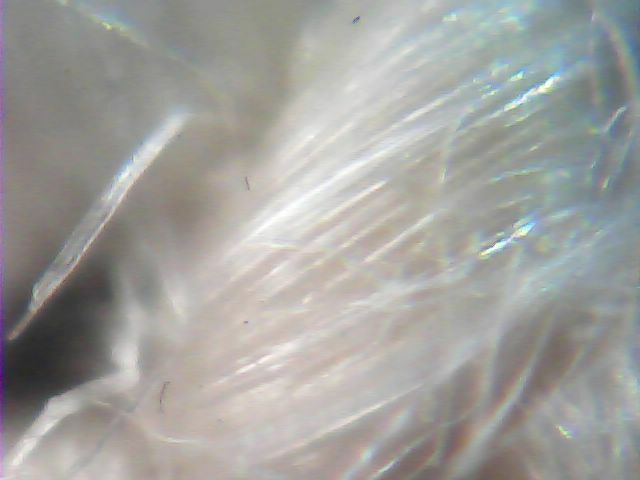 Here’s B (OIL only control) under the low power microscope. Note the faint yellow patch, distinct from white fibres. 5. Close up of yellow discoloration produced by roasting in hot oven an imprint of my fingers onto wet linen using vegetable oil only as imprinting medium. 6. The same as above, given maximum contrast in MS Office Picture Manager. Now let’s take a look at the other control, FLOUR only, still as is (not soap-washed as per final attenuation step), and see if that shows the expected appearance, based on my recent experiments, i.e. selective coloration of the thread crowns. 7. FLOUR only control (still to be washed) with gummy resinous-looking imprint, largely though not exclusively confined to the crowns of threads. Fine. So the FLOUR only control is broadly in line with expectations. (It will be washed later and re-photographed to show the fainter image that survives). Now for the interesting part: the FLOUR with added VEGETABLE OIL. Back once more to the microscope. Time now 10:20. Have spent the last hour or two amazed at the variety of new detail in the FLOUR/OIL photomicrographs. In fact there’s so much to see that it would be a mistake to try and summarise it here. I shall be content to display a few fields that make a point. 8. 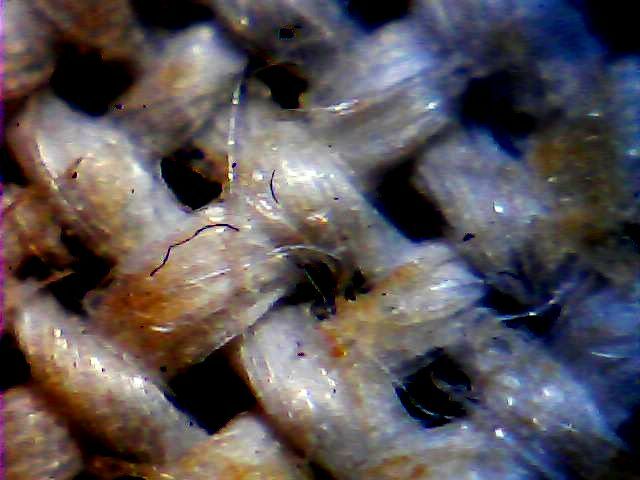 Single intensely-coloured fibre in the FLOUR/OIL imprinted linen showing a discontinuity. Yes, one of the most striking differences in the oil-supplemented flour imprints is the much greater range of colour intensities, i.e. no “halftone” effect. It’s esay to spot high-intensity fibres like the one above, and then to spot those discontinuities that exist (as above). Is this surprising? Hardly. The model accounts for the half-tone effect in unsupplemented flour as the due to there being limiting amounts of oil, that present in natural wheat grain endosperm and thence white flour. There’s enough to ‘bleed out’ of flour particles and track along linen fibres, producing a faint yellow coloration, but not enough to produce an intense one. When there’s no shortage of oil, as in the oil-supplemented system, it’s then possible to exceed greatly the halftone level of coloration. Note however that discontinuities still exist. Well now, that didn’t take long: three samples processed, examined and reported on. 9. Experimental test of the ‘hot seeping oil’ hypothesis: end of Stage 1. The next step is to wash the samples with soap and re-examine under the microscope (cut outs for the completed first stage post-oven/ pre-wash microscopy can be seen, shaped-coded so as to avoid mix-ups). 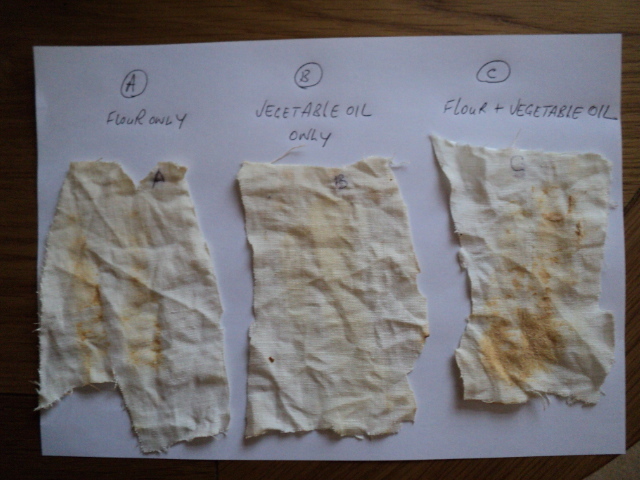 Here’s a reminder of an image from a recent posting, showing a reasonably close resemblance between image fibres in the standard dry flour model (no added oil) and the TS. That’s at the final attenuated stage (after vigorous washing with soap and water). Let’s look now at a half dozen or so views of the oil-supplemented model at a compable soap-washed stage, with a very faint image. All are shown “as is” versus high contrast. I shall add captions later, allowing visitors to this site to form their own judgement. Experimental testing of the ‘migrating oil’ hypothesis, i.e. attempts to falsify? Have scarcely begun to think about that as yet, having been preoccupied with developing it, i.e. building it up. No doubt there will some who will be only too keen to knock it down for me! 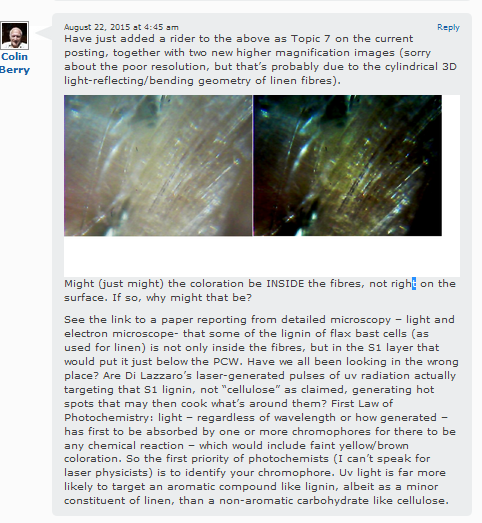 There are ssme very simple things that could be done if this blogger had access to lab facilities (sadly he doesn’t). More on that later. Note of caution: the schematic diagram shows the oil being wicked away from the reaction zone on the outside of fibres. That’s an entirely unjustified assumption. Linen fibres have a central lumen, which in 3D represents a cylindrical hollow core. Who’s to say the hot oil is not wicked away along nature’s capillary tube, cooking the fibre as it does so from the INSIDE? Something one might try is substituting a microwave oven for an ordinary electric fan oven (if uv excimer lasers then why not microwave ones? 😉 One would place a wet flour imprint onto linen first and microwave. The radiation acts by making water molecules spin. The water gets hot and evaporates. Prediction: the oil in the flour will then seep out and track along the fibres, possibly a little outside the imprinted area (check with microscope). Then repeat the experiment with some added vegetable oil. is there greater migration out of the imprint area? 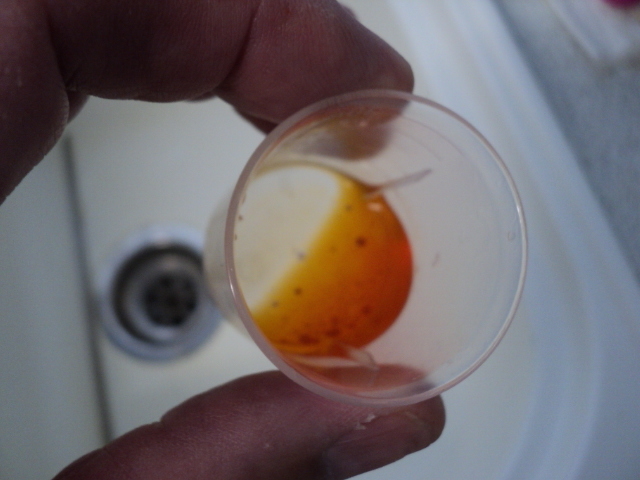 Then find something that is coloured and fat-soluble that can be dissolved first in the oil, and used as a visual marker. See where the colour goes, and whether it shows (a) discontinuities and (b) a half-tone effect. 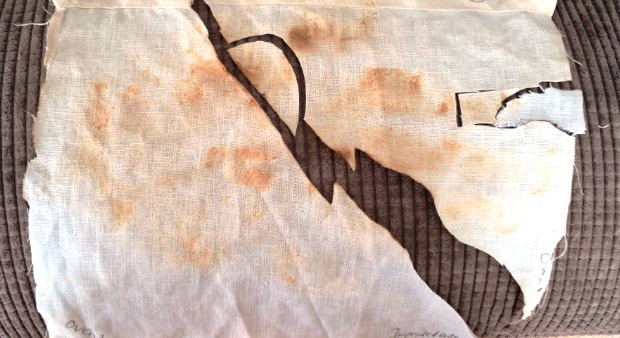 Effect of microwaving a dry flour imprint, no added oil, onto wet linen. “As is” left, high contrast right. Downsides: the three samples were not heated evenly, with one side of the flour or flour/oil imprint being well toasted in appearance, the other scarcely affected. This is presumably due to (a) the highly directional nature of the wave guide hardware and/or (b) a lack of reflecting surfaces on a linen sample to ‘smooth’ the flux of incident radiation via multiple reflections. There was also no visible coloration of the OIL ONLY control. The possibilty of using microwaves as an agent for targeting the water (internal heating so to speak) seemed attractive initially from a research standpoint, being easier to meter the input energy with a simple on/off switch, but that would seem the only advantage, more than offset by the uneven heating. back to the fan oven. 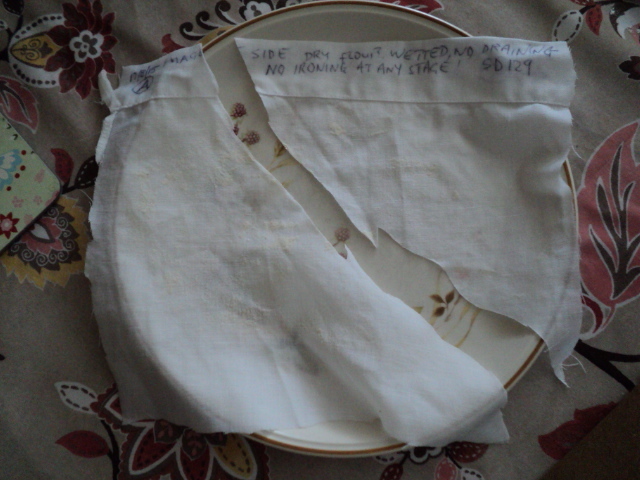 TOPIC 5: Step by step guide to modelling the “Shroud” body image, starting with dry white flour and wet linen. Some microscopy for good measure. 1. 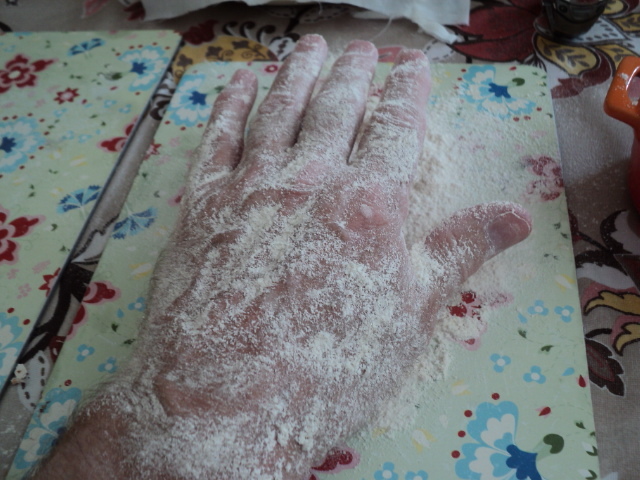 Dust skin liberally with dry white flour. 2. Drape pre-soaked linen (20 mins in warm water) over hand. Pat down firmly with free hand, to imprint the top surface only (not the sides). 3. 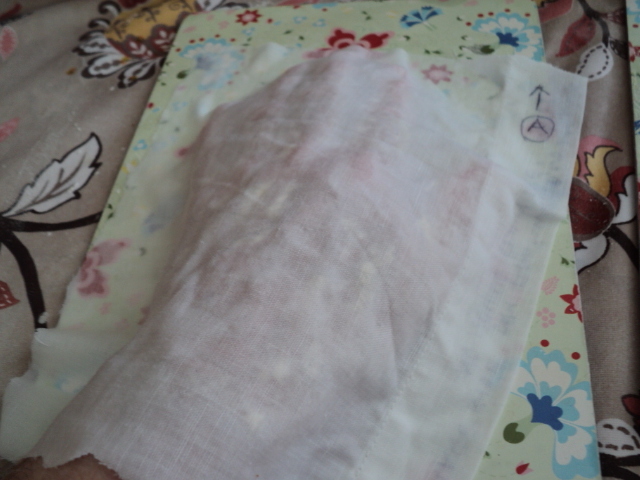 Appearance of hand after peeling back the linen. 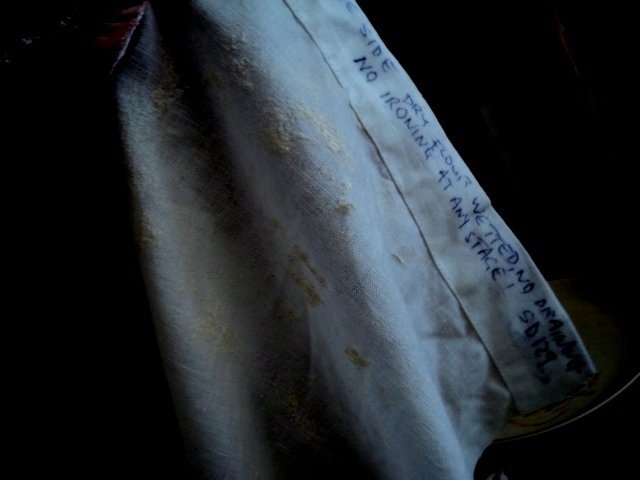 Most of the flour has been transferred to the linen as a contact-imprint. 4. The imprint is difficult to see in an as-is photograph. It’s visible when one adds max contrast. 5. The imprint was divided into two, one half going straight into a pre-heated oven at 200 degrees C approx. the other being allowed to partially dry in air before similar oven-heating. 6. The imprint becomes a golden-brown colour very quickly in a pre-heated oven (5 -10 mins). This slide shows the as-is versus high contrast image. 8. Appearance of imprint under microscope before (left) and after added contrast (right). Note the selective coloration of the crowns of threads as per “Shroud” body image, in this instance due entirely to physical contact between flour particles and the raised parts of the weave of wet linen. 9. . First stage imprint (from oven) now washed thoroughly with soap and water, using a kneading action to remove the detachable brown crust, leaving resistant underlying image. 10. Back to the microscope to view the final attenuated image. Samples are viewed under top illumination only (thus black interstices). 11. Final attenuated image from imprinting with dry flour onto wet linen. Seen here as-is (very faint, as expected, and indeed required of a TS model, but TS-like confinement of most colour to crowns is clear. 12. As above with added contrast. 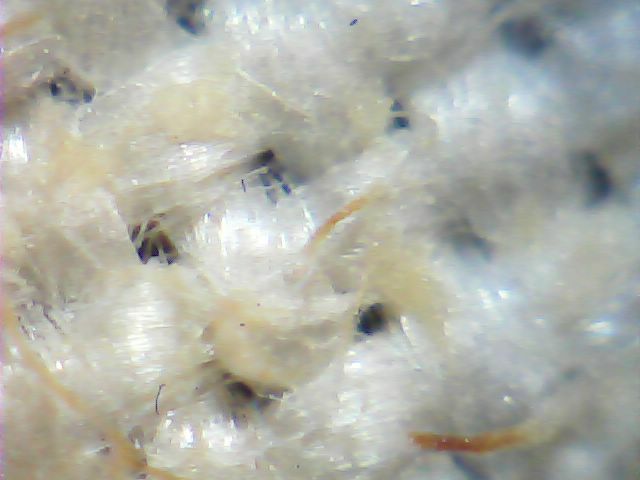 These fibres still look too gummy. The linen needs a second wash.
13. 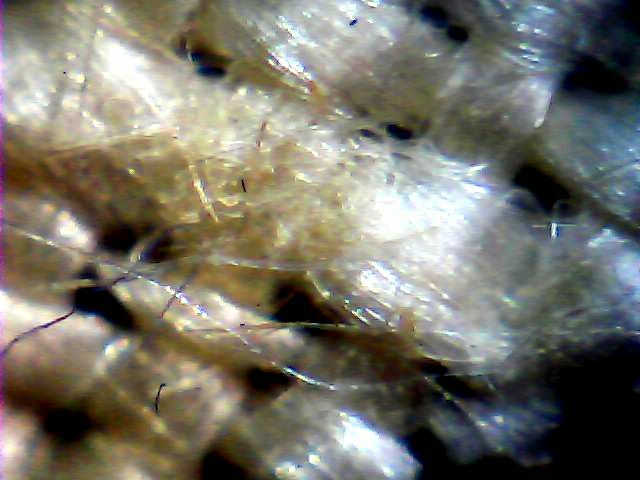 Here’s another view of the threads and fibres in the washed attenuated image. Left: ‘as is’ (scarcely visible); Right: with extra contrast. Almost there for the current Topic. I may add a few more microscope fields in a day or two, especially those where one can see individual fibres that have detached partially from their neighbours in the thread bundle. There’s one thing about which you can be absolutely certain Don. 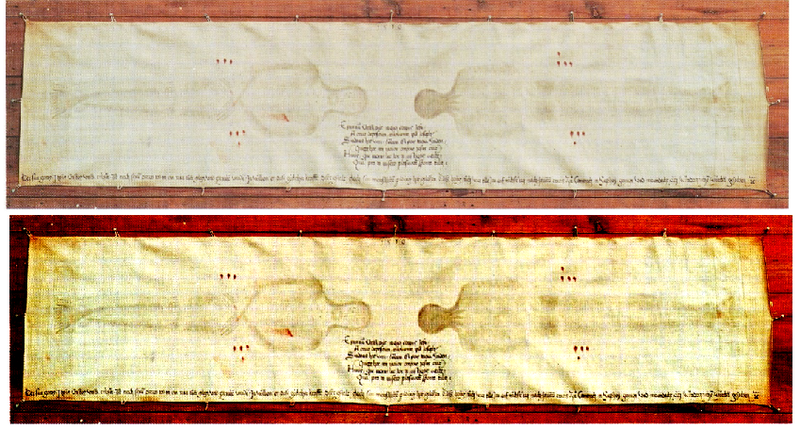 Despite seeing the “Shroud” as having a medieval provenance, making its first clearly-documented appearance at Lirey, mid 1350s, this blogger does not imagine for one moment that the conjoint image we see today comprising blood and body image is necessarily the one the first cohorts of pilgrims saw. Indeed, the Lirey Pilgrim’s badge ought maybe to be seen as representing a Mark 1 body image, now largely if not completely disappeared, with few if any bloodstains, including scourge marks initially. The 1516 “Lier copy” shows bloodstains – notably the lance wound site, nail sites in hands and feet etc, but note the absence of those intricate trails on the forearms, the ones which, on the TS, have an almost stencilled-on look (!). Pre-1532 Lier copy of the TS (1516), low v high contrast. One has to look closely at subsequent events in the “Shroud’s” history to see where there may have been opportunities to refurbish or otherwise “improve” on the initial Mark 1 image, including further additions of blood, whether real, simulated, or a mixture of both. There was an opportunity to do that in the immediate aftermath of the 1532 fire. Click to enlarge. Note carefully the reference to the “canonical investigation” that occurred in 1534, as clear an indication as one could ask for that the post-fire TS looked suspiciously different from the pre-fire version. 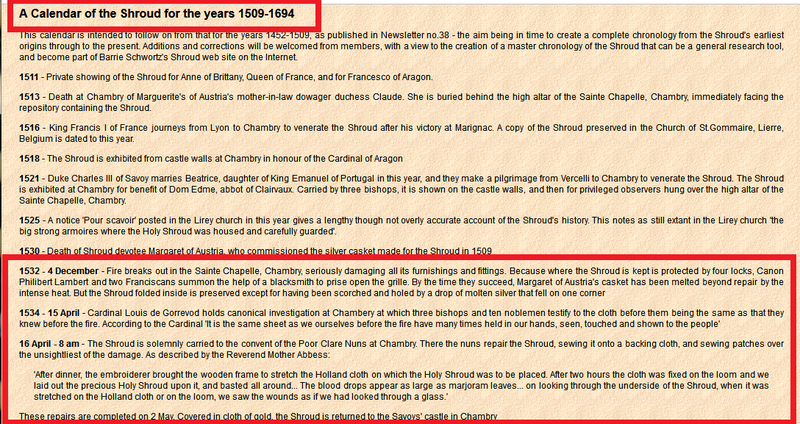 Note too the surprise expressed by the Poor Clare nuns at the vivid appearance of the “blood”. Hmmm. If as I now strongly suspect, the initial body image was achieved using dry white flour, then there is no reason why the same material could not have been used for “touching up” purposes, with or without simultaneous application of blood. It’s the heat development step that is the problem, at least where the accompanying blood is concerned, but the “blood first/image second” chronology suggested by Adler/Heller (if true) becomes less of a problem if blood had been applied on top of a highly faded Mark 1 body image, the latter then being refurbished with fresh flour or some other source of additional yellow pigmentation so at to retain an apparent “blood first” appearnce relative to predominantly Mark 2 body image 450 years later when STURP arrived to collect its sticky tape samples. Detailed description of the most recent dry-flour imprinting experiment (producing those long-awaited colored crowns), originally flagged up as in-the-pipeline Topic 4, will now be Topic 5. Expect it to appear, probably as staggered instalments, during the next 24 hours. TOPIC 3: How was the Mark 1 flour-imprinting model arrived at? Why the sudden switch to the Mark 2 version (dry flour onto wet linen)? From this blogger’s recent photoarchive: Left: a typical imprint of his hand using a wet flour slurry, followed by heating (hot iron). Right: a much fuzzier more TS-like image obtained by imprinting with dry flour onto wet linen, followed by heat treatment (oven) and final washing with soap and water for that iconic ghostly-look. The cut-out sample was for microscopy. Colin has now been attempting to reproduce the properties of the image for some three years, with indifferent success only, although I applaud his perseverance. Might we suppose that a less chemistry-informed artisan would have struck it lucky any sooner? (See too the latest expression of smug superiority). Good question, despite the edge. Given the current model uses a simple commodity – white flour – which incidentally WAS available to well-off folk in medieval times –then a modern-day “artisan” with no chemical background might well have suggested it, and everything in these last dozen or so postings could have been common knowledge for centuries. But it didn’t happen. Why not? Could it be that artisans with no scientific background have much better things to do with their time than attempt to reproduce the TS image? Why am I bothering? It was the claim from Di Lazzaro, based on his lasers, that the TS image was far too subtle and superficial ever to be reproduced – implying a supernatural event. That was a challenge to science, one guaranteed to provoke at least a few into action, those who look at an image and think: is it really as non-reproducible as we are led to believe? It is hardly surprising that science and scientists, having thus had the gauntlet slapped across the cheek, responds with the approach that comes most naturally, which in this instance is that of the biochemist with a grounding in chemistry and physics: an attempt to tackle the problem at a fundamental, molecular level and (hopefully) reasonably systematic programme of research, leaving no stone unturned, a far cry from the hit-and-miss approach of an artisan who sees the project simply as an exercise in cookery. So what led this investigator to return to flour as an sensitizing agent. Yes, there was a brief dabble in Ocober 2014, and earlier ones with other organic material – lemon juice, glucose, starch etc etc ). The focus was on what I termed “thermosensitizing agents” in the very first week of posting back in January 2012, including a brief nod towards Maillard chemistry (i.e. non enzymatic browning reactions). Having worked for 12 years at the Flour Milling and Baking Research Association as it was then called may have had a subliminal guiding influence. Certainly I do not equate white flour with pure starch as do so many of the diet ‘experts’ in the media. White flour from typical soft-milling European wheat, excluding the hard durum varieties, typically has about 8-9% protein, and it was that protein that was the cause of some interest in April/May this year. I had been checking out sulphuric acid, suggested as a possible imaging agent, maybe as a contaminant in medieval imprinting inks etc (see J.Accetta) and getting nowhere. Why sulphuric? Why not nitric acid? That stains the skin yellow – due to the so-called xanthoproteic reaction with protein. Nitric acid produces only a faint discoloration of linen. Might it give a stronger TS-like colour if the linen is pre-coated with a source of protein? That’s when white flour re-entered the thinking – through following a chemical route – one for which I make no apologies re the time taken. If white flour was so obvious as an imprinting medium – flour note, NOT starch – then why is this blogger the first it would seem to be using it? Yes, it was that switch from sulphuric to nitric as suspected chemical developing agent (still shown in the banner above) that put the focus first on protein sources in general, and then on white flour in particular. Why? Because it also has useful physical as well as chemical properties. It’s a good imprinting medium in the context of skin to linen. As a slurry in water, it spreads easily to make a thin layer, the linen adheres amazingly well to the coated skin, and when the linen is pulled back most of the flour paste transfers to the linen as an imprint. Initially that imprint was developed in nitric acid to get the yellow colour. Then limewater was found to work, but it had to be hot. Maillard reaction between reducing sugars and protein? That was the cue to try heat alone – e.g. by pressing a hot iron onto the imprint, and that worked too, although my severest critic claimed the border of the image was too sharp to be considered a model for the TS. In fact it didn’t take long to appreciate that the hot iron stage, while problematic in a practical sense (medieval folk were unlikely to have anything comparable to the modern-day electric iron in terms of temperature control) there was a crucially important role for it where “selling” the model was concerned. The hot iron could account for one of the most cited aspects of the Shroud’s microscopic features – the confinement of coloured fibres largely – though not exclusively- to the crown of the threads, i.e. the highest part of the weave. All that was needed was a reasonable assumption that pressing an iron onto linen results in contact with those crowns only, assuming the applied pressure was not excessive. If the linen had been coated first with flour paste, air-dried and then pressed, it was not unreasonable to suppose that the image would appear as a pattern of dots, due to coloration of flour that received most conducted atom-to-atom heat through being situated on the crowns. Flour that had settled at lower levels in the weave might escape being browned, and could be washed out leaving just the microscopically-mottled distribution of crown colour which the unaided eye, viewing at the gross level, would perceive as continuous and unbroken. Cue now the switch to using dry flour, straight from the bag, as imprinting medium. The use of solid powder in TS modelling is of course not new. Garlaschelli’s “frottage” technique with metal oxides, e.g. iron ochre, is perhaps the best known. But he covered his volunteer student subject first with protective linen, then applied the powder, rather like the technique of brass rubbing. It’s a technique guaranteed to produce a negative image, certainly, and one this blogger briefly tried, but found it difficult to master or get a satisfactory result. It was decided to use dry flour in exactly the same way as the slurry, almost as it dry paint powder, i.e. to sprinkle it DIRECTLY onto the anatomy to be imprinted (possible in view of non-toxicity, and easy to wash off) distributing with brush or fingers until an even distribution had been obtained (uneven distributions could be investigated later, e.g. to see if 3D properties can be engineered). But there was a problem. Dry flour does not transfer well to dry linen. Solution? Simple: use WET linen instead. There’s an immediate advantage from doing it that way, i.e. dry flour onto wet linen. The resulting imprint might be predicted to have a fuzzier border. That indeed proved to be the case, and no time was lost in reporting that. There were additional less obvious advantages of imprinting with dry flour. There’s a lower risk of getting an image with the lateral distortion that some armchair critics of contact-imaging seem to think is unavoidable and thus huffily dismissing the technique from consideration in favour of radiation models etc. With wet slurry one can always paint the highest parts of the relief only such that linen can be moulded to skin without fear of picking flour from unwanted parts, notably the sides and thus preventing any lateral distortion at source so to speak. But that option is easier said than done, and my critic was quick to point out lateral distortion in an image that he cut-and-pasted from this site to shroudstory. Substituting powder for slurry virtually excludes any possibility of lateral distortion. Why? The reasons need not detain us: one has only to look at the imprints obtained with powde, like the one that was tone-reversed Second Pia- style which Dan Porter displayed on shroudstory: there is no obvious lateral distortion. The simple technique of dusting with flour, then draping with wet linen, applying firm vertical pressure to the highest relief, was enough to see to that. But what does one do to the fresh imprint to develop the colour? There are options that had to be addressed, and indeed are still under study. Does one let it dry and set first? Does one try to fix it with dry heat first, e.g. by pressing with a hot iron until it becomes visible, or indeed attempt to use prolonged contact with a hot iron as the means for maximal colour development? What about the non-image areas that gradually acquire a faint but uneven scorched appearance? There was a rationale for applying a hot iron first. Why? Because that could ensure there was some preferential colouring of the crowns of the threads, needed to reproduce that well known characteristic of the TS image. But an ironing step alone often failed to produce a conspicuous image – not in itself a liability, thinking of the faintness of the image in Turin (though it could be argued that much of that was the result of ageing) but because a final washing stage was considered necessary to remove excess crusted-on flour, leaving a faint ghostly superficial image. Yes, one is making no attempt to conceal the fact that any attempt to start with something as ‘crude’ as a flour imprint needs a final image-attenuation step to achieve the ghostly look, one that is modelled at present by washing with soap and water. (There is a fallback position if that is not sufficient to ensure credibility, which is to boil in water). Anyone who thinks these treatments are unthinkable need only read Lalaing’s account from (insert date) of the way then TS image was “tested”, e.g. “boiling in oil” which though exaggerated may well have been done, not for the reason stated, but as part of a medieval modeller’s own attempts to achieve his own goal, not to match an existing artefact, but to re-create what an ancient body imprint as sweat and blood on Joseph of Arimathea’s linen might look like centuries later. We have finally reached the last crucial question that was asked, was put to the test, and found to give the predicted answer. Could the ironing step be omitted in the dry flour-imprinting model? Was it realistic to imagine that particles of dry flour transferred under firm pressure from skin to wet linen might attach to the crowns of thread in preference to lower parts of the weave? The answer was a tentative YES! The flour particles would transfer to the first part of the linen with which they make contact, and being whole cells (crushed endosperm of wheat grains) and large in relation to conventional imprinting media might reasonably be supposed to stay put, and resist being dissolved by the surrounding water. Cells and their macromolecular stored granules of starch and protein do not dissolve in cold water. That was the hypothesis under test yesterday (Aug 17). The very first sample taken from an oven-roasted dry flour imprint onto wet linen did indeed show a preferred tendency for coloration of the high crowns. There is still much work to be done in checking if that field of view is typical or not. Be that as it may, this blogger would maintain that a single image alone that shows the specific coloration of crowns in a system that did NOT require the application of a hot expanse of flat metal to linen means that crown coloration can be accounted for, at least in principle, simply by pressing wet linen with its corrugated weave with ridges and grooves onto a powder-coated subject. (It’s occurred to me in writing this that one could do experiments using fine carbon (soot etc.) that would give a convincing demonstration of the ability of the crown threads to selectively sequester/trap/harvest fine particles). With each passing hour and day, the flour imprinting model seems to have more and more going for it. In its latest guise – imprinting with dry flour onto wet linen – one has, if not killed, then at least ruffled the feathers of two birds with one stone: image fuzziness AND preferential crown coloration. Taken with the earlier observation of what looks tantalizingly like that so-called halftone effect at individual fibre level (one I prefer to call two-tone, or dual-tone) I would confidently predict that the quest to model the TS image will soon be over bar the shouting (the latter having already started). TOPIC 2: Taking stock of the new dry flour/wet linen model; responding to some negative feedback. Yesterday, this blogger/investigator reported an important new finding when it was barely an hour old. Given the finding was not a chance one but predicted from new thinking, and given it offered a new explanation for a long-standing conundrum – why is the Shroud image confined mainly to the most superficial part of the threads – the so-called crowns – it was considered important to share that information. There was also the small matter of claiming priority before someone else does (sorry, but scientific research and its reporting is, always has been and always will be competitive). However it seems one may be moving too fast for one of my harshest critics on the shroudstory site, he of the cruise missile launching pdf tendency. His pained question: “Why was I now using wet linen?” suggests that the new Mark 2 strategy with dry white flour has not been understood. As for the suggestion that I should have fully documented the Mark 1 model before switching to Mark 2, one might be forgiven a wry smile. It was the same critic constantly pointing out a perceived fault with the Mark 1 technology, and indeed its predecessors, the Mark 0, Mark -1 etc etc., namely that it produced an image with too sharp a border, that led this blogger to realize there was a simple expedient that could produce and explain the fuzzy border demanded – switch from imprinting with wet flour slurry onto dry linen, to imprinting with dry flour onto wet linen. I assumed that posting images of the new Mark 2 “fuzzy border” images would be sufficient to make obvious the rationale for the Mark 2 model, and one could then use the new model to make the crucial “crown thread” prediction and quickly perform the test, reporting as I did yesterday the successful outcome and making no secret of my sense of triumph ( I have been researching the TS image since Dec 2011, and recognize a breakthrough when I see one). I shall post this as Topic 2, then spend a short time composing and posting Topic 3: that will explain how and why Flour Model 1 (wet flour slurry/dry linen) became Model 2 (dry flour/wet linen), and how that switch allowed for a new explanation for crown thread imprinting without needing the intial pressing of the fresh imprint with a hot electric iron that was considered obligatory in the Mark 1 version, which has now been dropped (though it may be re-introduced later for different reasons). Confusing, isn’t it? But then we are discussing an artefact whose image has eluded explanation over many decades of study. Did anyone seriously imagine the final answer was going to fall out quickly, and that if or when it did it would be capable of being communicated in one or two simple sentences? There is still much that is unexplained in the new Mark 2 model, namely the mechanism by which a chemical reaction that starts in an acquired coating can communicate itself to the underlying fibres on an apparently all-or-nothing basis (the so-called half tone effect) so as to leave a faint but resistant image (resistant that is to vigorous washing with soap and water). 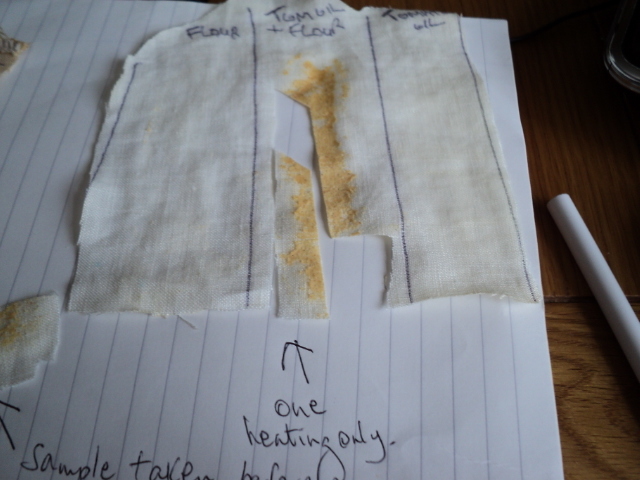 When Topic 3 has been posted, later this morning, I shall then compose Topic 4 to explain everything that was done experimentally yesterday (and more importantly – not done – like NO ironing) to confirm the prediction of crown thread coloration in the new Mark 2, dry flour/wet linen model. In fact that experiment is still far from complete, it having generated 4 variant imprints that still await microscopical examination, so a Topic 5 will be appearing later this week to complete the reporting of yesterday’s experiment. TOPIC 1: Are we nearly there yet, after some 43 months of twists, turns and blind alleys? Yes, I do believe we are – namely in sussing out how the “Shroud ” of Turin might have been engineered by a medieval entrepreneur as the ultimate in holy icons. So ultimate in fact that many to this day see it as a holy relic (the real thing!) despite constant reminders from Popes (well, some at any rate) to view it as an icon – an aid to faith, not a prop. So what gives with the confidence from this particular researcher who’s normally reticent about making any kind of over-statement? Answer: this photomicrograph obtained just an hour ago. 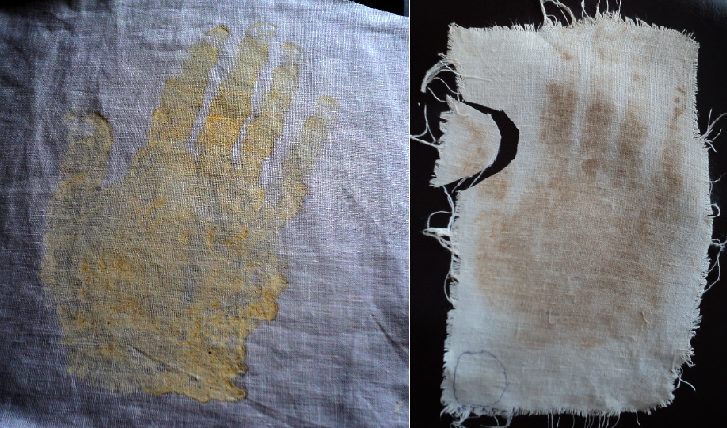 Left: flour imprint of this blogger’s hand onto wet linen, followed by a few minutes in a preheated oven. Right: the same after adjustment of brightness/contrast/midtone value in MS Office Picture Manager. Note the localization of the coloration to the highest points of the linen weave – the so-called crowns. That is a key characteristic of the “Shroud” body image – one that has proved very difficult to reproduce in model systems except by contact-scorching off a hot metal template – a model this blogger has explored in detail (2+ years!) but found lacking in a number of crucial aspects that need not concern us for now.. What caused the change of approach? Answer: the clues from the Lirey Pilgrims’s badge or rather its Mark 2 (?) 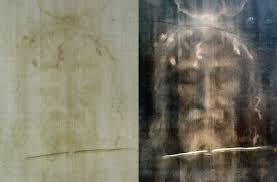 version – the so-called Machy mould- namely that the “Shroud” of Turin was meant to be seen as a blood AND sweat imprint, real or simulated left by the crucified body of Christ on Joseph of Arimathea’s linen, used to transport the body from cross to tomb and NOT intended as the final burial Shroud (thus my use of “Shroud” rather than Shroud). What you see above is probably not the final image pigmentation we see today, being a precursor stage. There are grounds for thinking (see postings preceding this one) that the above coloration was deliberately attenuated to make it fainter and more ghostly. This comparison between model and “Shroud” accompanied the previous posting (original caption).The “hot electric iron’ or medieval equivalent is no longer needed: simply pressing wet linen against a flour-dusted hand gives preferential attachment of the imprinting medium to the crowns of the weave. It’s an end-stage step that can be modelled simply by washing thoroughly in soap and water. See the photomicrograph that concluded the previous posting (under the concluding Topic 13). For now I shall post this long-strived for result, and return later in the next few days explaining how the image for the above microscopy was produced, and how it was initially processed to get the above result. We will then follow its progress through the final attenuation step and see how the final image compares with that of the “Shroud” in the Mark Evans photomicrographs. This entry was posted in Uncategorized and tagged concentration of colour on crown threads in weave, flour imprint, microscopy, new model for the Turin Shroud. Bookmark the permalink.